I never thought I would like this sandwich as much as I did? I really really really LIKED it! It was one of those sandwiches where you are so full, but you don't want to stop eating, because it tastes so good. This sandwich will be making a frequent visit to my dinner table. I served them with these yummy steak fries and it was one heck of a meal. Heat olive oil in a large pot or skillet over medium-high heat. While oil is heating, sprinkle all sides of the roast with kosher salt and freshly ground black pepper. When the oil is very hot, carefully place the roast in the pan and sear it on all sides. This shouldn't take more than a few minutes - you just want to quickly brown the roast to add flavor and seal in the juices. Transfer the roast to your slow cooker. Sprinkle onion soup mix over the roast and add water and beef broth. Cook on high 4-6 hours or on low for 8-10 hours. You can also cook it on high until it begins to boil and then switch the heat setting to low; this is our preferred method because it seems to make the meat more tender. When the meat shreds easily with a fork, shred the entire roast. Serve on sliced crusty rolls with a slice or two of cheese. If desired, you can slide these under the broiler on your oven to toast the bun and melt the cheese. 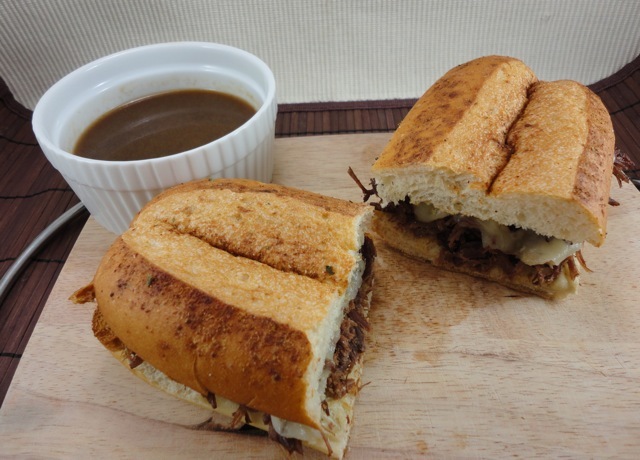 Serve with the juices from the slow cooker as au jus for dipping. Serves: 6-8. 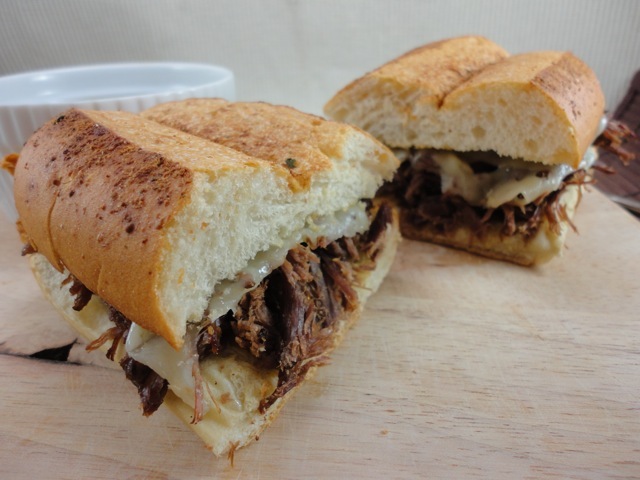 Jenn's Notes: I used just over one pound of roast and it was perfect for two very large sandwiches. I cooked my roast in my dutch oven instead of the crock pot. I seared it, added all the ingredients and then brought it up to a boil and covered with the lid and put in the oven. Cook at 275 degrees for about 1 1/2 - 2 hours per pound of meat or until it easily shreds with a fork. I served on toasted Garlic Parmesan subs and topped with provolone cheese! My sauce had thickened so much during cooking that I had to add some water to it, so I would be able to dip my sandwich in it. All around this sandwich was DELICIOUS. Thank you for stopping by my blog today, Jenn. It's nice to "meet" you! Glad you liked the coffee buttercream frosting ... believe me, it's dee-lish! OMG! I'm drooling over here! This is something I have so completely missed from the US! I think I'll have to make this in the near future. Thank you! What cut of beef roast do you use or does it matter? This is my favorite sandwich, cant wait to try it! @Michelle in NC - I honestly can't remember exactly what type I used? I probably used a chuck or a rump roast? I usually use whatever is on sale at the time. I really enjoyed this sandwich!! Thanks for this! Iwas looking for a recipie just like this..that would be easy and ready for a hungry crowd! Yum! Thanks for the mealtime inspiration.